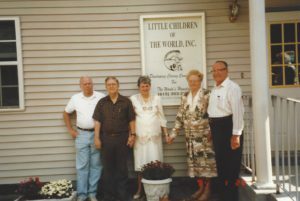 Little Children of the World (LCW), LCP’s USA-based sponsoring agency, is a not-for-profit Christian service organization incorporated in October of 1987 in Atlanta, Georgia for the purpose of addressing the plight of street children in the developing world. The LCW founders were Dr. Douglas and Bettie Elwood, Peggy and Dean Houk, and Luther Carroll. LCW seeks financial support for LCP programs and provides management oversight and program guidance. It promotes and publicizes LCW programs, activities and achievements, investment management, and facilitates communication between sponsors and sponsored children. The governing boards were created: a Board of Directors and an Advisory Council. The members represents a broad geographical expanse ranging from Hawaii and Washington in the West, to Massachusetts and North Carolina in the East. A LCW Endowment Fund was later established for sustainability. A LCP Board of Directors was soon created, which is presently composed of representatives from the business, educational, and governmental sectors of the city, LCP youth, and parent representatives and Little Children of the World. A Child Sponsorship program was expanded, whereas sponsors from around the world are matched with needy children. Once sponsored, a child has access to all the benefits of the LCP programs. A self-HELP strategy was developed, highlighting the basic needs of the children, including Health, Housing, Education, Livelihood, and Peace and Faith (Christian values formation). 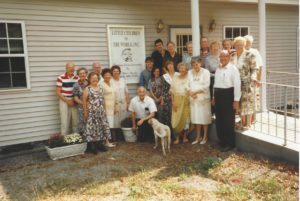 A farm was purchased in Candau-ay in 1990, through the generosity of Second Presbyterian Church in Bloomington, Illinois, and thus came to be called the Bloomington Farm. About the same time, the Presbyterian Church in Sudbury, Massachusetts began funding for the LCP preschools. During this same year, a program was established for young girls at risk, called Wee Women’s program. This program was later expanded to include two boys dorms presently called Robert Hanson Dorm and Consuelo Dorm. The following year, 1992 a three story building was completed in Etowah, Tennessee, for a LCW office and was built by Luther Carroll. Also in 1992, a partnership was established with Teen Missions International of Merritt Island, Florida. They built and partly financed a girls’ dormitory on the Daro property, especially for young girls from dysfunctional families. Teen Missions also made it possible for LCP to begin sending a youth delegation each year to their Boot Camp in the Philippines. During the same year an auditorium/chapel was built, called the Chapel of the Doves, through funds raised by a Swedish volunteer and Larry and Glenna Waller. 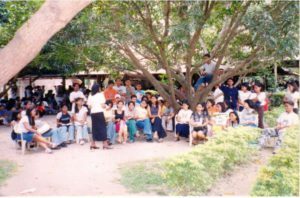 Another team from Teen Missions returned in 1993 to build a boys’ dormitory at the farm, which was completed later by the boys who lived in it as part of their on-the-job training, and with a grant from the Consuelo Foundation. In the same year a team from Grace Church, Santa Barbara, organized by Chris Elwood, built and largely financed a health clinic in Taclobo on property donated by one of LCW’s child sponsors, Betty Goodell, from Newark, Delaware. An LCP Handclasp Program for children with disabilities from low-income families was established in 1996. An agreement was made in 1998 with the Netherlands-based Liliane Foundation to cover the expense of surgery for children with an inborn disability. In the same year LCW Board Members, Lee Betts and Glenna Waller helped to develop a College Scholarship Fund for eligible college-age youth. In April of 1999, a Memorandum of Agreement was signed by Patti Lyons, President of Consuelo Foundation, for the construction of 32 houses for low-income families at LCP’s Bloomington Farm. Scheduled to be completed in October of 2000, the project is more than construction of houses; it is an experiment in developing a model community, using such indicators as self-reliance, interdependence and mutual caring. During this same year, the School on Wheels began as a pilot study under the guidance and through the financial assistance of an LCW Advisory Board member, Carol Coy. International volunteers also helped with the pilot study. The project takes education to the out-of-school youth in the barrios. Also, street children are brought by the LCP Easy-Rider to the LCP Campus for special classes. This is a program that gives the children an opportunity to take placement tests for enrollment in public school at their ability level. Later an In School SOW Program was added and funded by Sheena Pappalardo from Natick, MA. 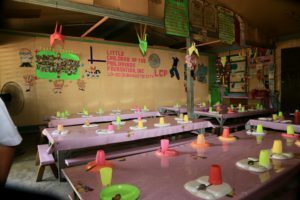 Later in the year a Soup Kitchen was started for malnourished kids in Looc, initiated by an international volunteer, Alex Nickerson, through funding from her church, Foreside Community Church, family and friends who continue to fund this soup kitchen today. The long-term goal of this project is to impact the lives of these children, from Dumaguete most blighted community, so they will be healthier and happier and able to attend school. In 2001, a Memorandum of Agreement was signed between LCW and Consuelo Foundation for a Multi-Purpose Building Complex estimated at the cost of $240,000. Ground breaking took place in 2002. The dedication service was held November 23, 2003 with three thousand people attending. In 2002 Dean and Peggy Houk purchased a six room brick building located at 333 Sims St. in Barnesville, Georgia to house a new LCW office. Also in this year, Marie Lou Patrimonio, one of the beneficiaries of the LCP program in Dumaguete was awarded a one year full College Scholarship to Gordon College in Barnesville, Georgia by the Barnesville Rotary Club. Larry and Glenna Waller were her host family. 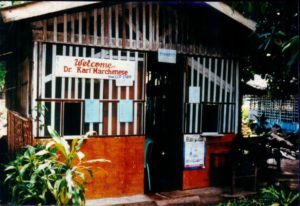 In 2003 memorandum of agreement was signed between LCW and Marciana Hope, Vancouver, Washington to establish a Leyte Program in Leyte, Philippines. Also in 2003, a second soup kitchen in Canday-ong Community was begun by volunteer, Timmy Shutz through his church, Webster Presbyterian Church located in Webster, New York. They continue to fund this Soup Kitchen each year. A memorandum of Agreement between LCW and the Christian School of New Vision in Haiti was signed in 2005. Ludner St. Amours serves as Haiti Project Director and the US Board chairperson is Marcia Fisher, Heiskell, TN. 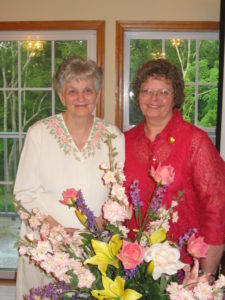 In 2009 Bettie Carroll Elwood retired as President/CEO of Little Children of the World and passes the leadership to her niece, Glenna Houk Waller, daughter of Founders Dean and Peggy Houk. In 2010, Consuelo Foundation again partnered with LCW/LCP by building a new residential dorm for boys ages thirteen to eighteen. Over 250 people attended the Dedication of the Consuelo Residential Boys Dorm. In 2011, LCP received a grant from the “Presbyterian’s Women Thank Offering” for $17,105.00 to build a Meat Processing Building. This project will help LCP members augment income so that basic needs can be met for their children and families. 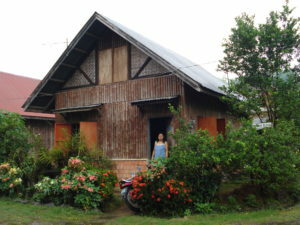 Also in 2011, the street running beside LCP in Daro, was named “Little Children Street” in honor of LCP. LCW celebrated its 25th Anniversary in 2012. 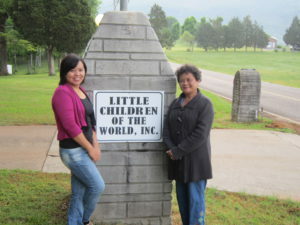 Carmenia Benosa, LCP Administrative Director and Cerila Patrimonio, Peace and Faith Steward traveled from the Philippines to the U.S. to be a part of this celebration and to fund raise for LCW/LCP. Also in 2012, the LCW Board of Directors elected Margie Mangham, Milner, Georgia as LCW Vice President of Development. In 2014 the LCW Board of Directors elected Marie Lou Patrimonio Abbott as LCW Vice President, Administrative Services, and in 2015 Melanie Waller Foster was elected as LCW Secretary, Treasurer by the LCW Board of Directors. October 30, 2017 marks the thirtieth anniversary of Little Children of the World. As of January 1, 2018, LCW has a new logo inspired by “lending a helping hand” and “giving a hand up to a brighter future.” We have over 700 sponsored children and counting. We are excited to see what the future holds for this ministry. Thanks to the our Lord and hundreds of sponsors and donors the work continues to impact the lives of over five thousand people in fourteen communities in and around Dumaguete City, Philippines as well as people in Leyte, Philippines.